The swingin’ 60s have arrived on Malibu beach and the people are down to boogie and the surf is fresh. Wild Water is a 20 payline beach adventure where you must match shark Wilds, surfer chicks and stoned hippies to try and earn yourself the 400,000 coin jackpot. For two decades, NetEnt have been coming up with unique and thrilling slot games, offering you superior graphics and sounds, along with fascinating themes. Each new addition to their portfolio further establishes the company’s well-earned place in the lead of the digital casino industry. 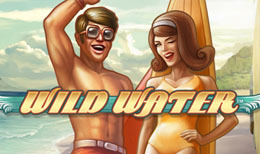 Wild Waters is an unforgettable slot game, combining 1960s and 1970s vibe with a fun day at the beach and serious prizes hidden among the wild waves. Grab your swimsuit and see for yourself! Escape not only to a beautiful summer day on the beach, but also to the worriless hippie times, when fun was all around. You’ll have wonderful company and the opportunity to surf through the warm water, touch the smooth sand with your toes and take advantage of the sun rays, all while listening to retro music. Wild Waters is definitely a mood booster, transporting you to a joyous time and in a fabulous setting, while the high-quality graphics only make it more authentic. It’s time for you to go wild! This slot game has 5 reels and 20 paylines full of chic retro characters and surfing fun. Uniquely, the symbols representing 5 different retro people are stacked, so they cover 3 spots on the reel in their entirety and they only count for wins if they’re completely shown on the reel. You can bet between 0.01 and 0.50 credits and adjust the level between 1 and 10, in order to suit your betting and winning needs. There’s nothing more thrilling than a day at the beach, but Wild Waters also offers plenty of features that are sure to help you maximize your wins. Pay close attention to the shark symbol, not only because of how menacing it looks, but also because it is the Wild card of this slot game. It substitutes any other symbol, giving you the chance to form more winning lines and get big rewards. In a Free Spin, the Shark expands and cover the whole reel, so you can win the line. Free Spins are awarded when you spin 3 or more of the Scatter symbol, which is represented by the cool surfing dude in action. You can win between 15 and 60 Free Spins, which is more than enough to exceed your expectations. The highest paying symbol is the golden surfing lady, and it gives up to 2000x your initial bet if you can spin 5 of them at a time. Then the Wild Waters really will turn golden for you! If you’re looking for Bonuses, look no more. You can activate the Surf’s Up Bonus by spinning any mix of 5 complete surfer characters, for a chance to be paid 20x your bet. The Surf Team Bonus is even more valuable, when you spin all 5 surfer symbols on the reels. A reward of 200x your bet is then waiting for you to grab it! So waste no more time and hop on the waves with this exciting slot game set in the 1960s. Wild Waters has a relaxing and fun theme that will help you rewind and use your imagination to travel to the past, where friendly surfers will help you win big. The graphics, music and gameplay are flawless and they have a unique feel to them, so you won’t get bored at all. Another game is waiting for you, Try your luck and play Zombies.